Two numbers of power tiller were also distributed to the farmers of Shurbi village under Chief Minister’s Sashakt Kisan yojna. 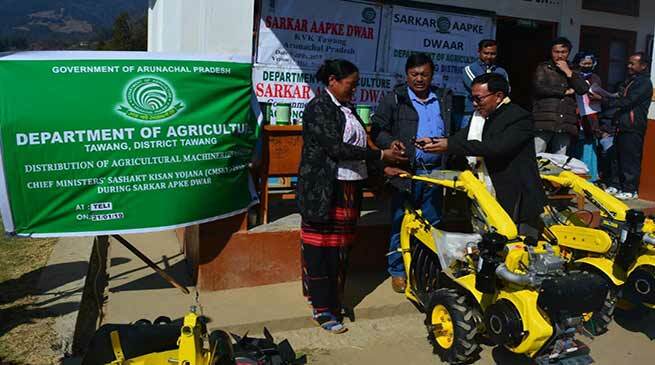 The 22nd round of Sarkar aapke dwar/ Jan Sunwai Sammelan was organised at Teli village, Mahabodhi School under Tawang circle. 45 govt departments participated in this camp and provided their service to the villagers of Teli, Shurbi, Yusum, Thangka, pempaling and nearby areas. Sang Khandu, EAC I/C DC Tawang inaugurated the camp, in his address to the gathering he informed about the Sarkar Aapke Dwar and its benefits which has been launched by the present govt. to provide govt facilities at the doorstep of villagers. After his address all the officers/officials and public present took the pledge of ethical voting. Two numbers of power tiller were also distributed to the farmers of Shurbi village under Chief Minister’s Sashakt Kisan yojna (CMSKY) ,after which the school toppers of Shurbi upper primary school were felicitated. In this 22nd round of Sarkar Aapke Dwar the two senior citizens staying in Mahabodhi Old age home Smti Tsering Pema 88 years old and Tenzin Tsering 78 years old were given facility by the officers and officials from Apex bank branch Tawang, and WCD department to open their savings account at their residence, since both of them cant walk upto the site of SAKD camp due to health reasons. CDPO Tawang Smti Dondup Pema, enrolled their registration for old age pension benefits. A 95 years old senior citizen and Ex- Gaon Burah of Teli Village Sang Dakpa, applied and received his ST and PRC certificate in this camp. Later in the evening Sang Khandu alongwith DMO Dr.Wangdi lama visited the old age home and meet the senior citizens staying there, and asked them about their health and other necessities.